Good stuff. They may be steaming in your eyes, but the fish will probably see them as tasty morsels. I don't really see anything wrong with them... they look a lot better than my first efforts... and I think Woolly (2 Ls) Buggers are supposed to be pretty ugly. Well done. They look a hell of a lot better than my first attempts. we can get you tying rock worms... Or maybe glow bugs. while i appreciate your kind words guys. I must say that the power of photography and instagram have hidden many of these flies faults. the woolly bugger is the worst of them all. and yes, it is addicting. fly tying videos have never been more interesting to me. 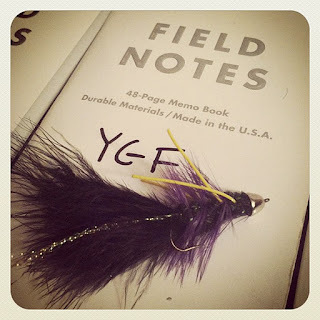 As my instructor told me while I was learning the basics of fly tying, "Some fish just want to commit suicide!" Thumbs up on that purple bugger! It'll do the job! I can't speak for Argentinian Techno, but it does sound like after a night with said mistress, you deserved to sleep in. 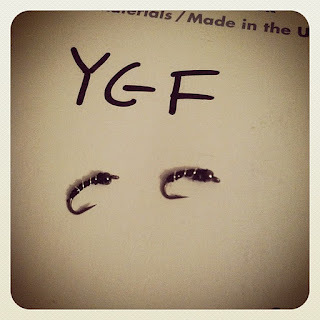 Welcome to the world of fly tying...good start! You've perfectly explained how I feel after I tie flies. This is why I don't enter them into tying contests :) Fortunately, fish aren't as harsh of critics as you are on yourself. Nice looking flies by any standard, especially after the sushi-rolling, Argentinian techno musicing, snowball fighting dinner party went later than expected. When you catch a good fish on those flies your gonna freak out. They look better that my first ones. Sounds like you better crank the music and throw several more parties. Before you know it, you'll have a fishy dozen. Sir, Now that you are addict dot tying, you can make life much easier on yourself. 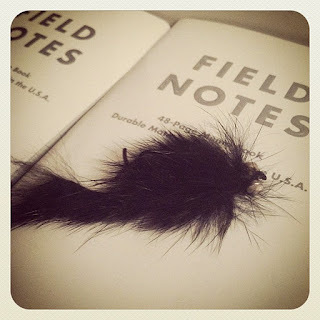 By completing the #1 goal on your site, you know that a pretty fancy-scmancy-dancy fly-tying apparatus awaits you. It's gathering dust in its box here hoping, praying, BEGGING to be used as it was intended. Eyes on your #1 Prize...& you get the Other Prize. What is Argentinian techno anyways? Does it sound like mechanized tango. All thump, no verve? yeah man! the funnest way to fish is with big nasties, you're hooked! they look good! I have gotta party with you someday! Most flys are made to catch the fisher not the fish... I don't see you having that problem. I kid you! I'd fish any one one those anytime. The addition runs deep my friend, be gentle with her! @parker - i am hoping that i find a couple dumb fish this weekend that want to eat these concoctions. @sanders - i certainly hadn't heard Argentian techno before. I can't speak to it's contribution to the music scene, but it certainly was catchy. @Fly Waters Edge/Kevin - i just hope the addiction is gentler with me. @Travis - i doubt one of the educated trouts of the Missouri would be interested in these offerings. @darkov - i know....hopefully soon. very soon. vise, you will be mine. @Fred - right. more Argentinian techno = more poorly tied flies. @d. nash - i certainly hope that is the case. @howard - you are too kind. we shall see what fly tying after a day that does not include sushi rolling, argentinian techno musicing, snow ball fighting and dinnering produce. Tonight is the night. @Mark + Wiz - it's going to be a total freak out. whatever the lucky fly is will go in the vault....or will it. I never saved the first fly I caught a fish on. I figured it was the only thing that worked and kept on using it until something broke me off (that something being a tree).